When I watch any silent film for the first time, it’s always with the expectation I might write about it. 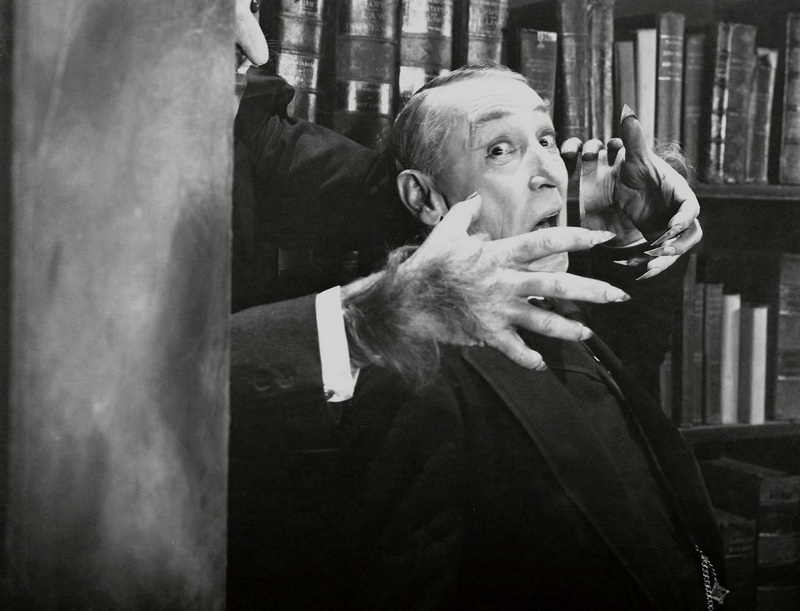 Last night, I had my second viewing of The Cat and the Canary, a horror-comedy I first watched, oh, about three years ago. I didn’t write about it back then because it didn’t leave much of an impression on me. It still doesn’t. The Cat and the Canary’s sometimes funny and sometimes scary, but it’s mostly goofy and grotesque, and my taste cleaves to more intense entertainment. That doesn’t mean the movie’s bad—in fact, you should see it for yourself. It just means that I need a good reason to give it 800 words. After my second viewing, I may have found one. But first the basics. The Cat and the Canary is the story of a will—one of those cinematic last-wills-and-testament crafted to torture those who hope to inherit from it; a post-mortem F-U from the deceased toward those who mistreated him in life. In this case, the middle finger is delivered by Cyrus West, a lonely old millionaire, dead twenty years when the film begins. Cyrus, it is claimed, was loved only for his money—he felt himself a canary, surrounded by cruel and hungry cats. And so he devised a will that could not be opened for two decades, and would gather together six would-be heirs, denying five in the face of the sixth. I’ve never quite figured this out. If Cyrus aimed to leave the money to the one heir he truly loved, why wait twenty years? He or she could be dead too, by then. Cyrus also tacks on a weird rider: if the rightful heir is judged insane, he or she loses the inheritance. This is supposed to be a reflection of Cyrus’ own bitterness at being thought crazy, but if he can sympathize, why put someone else through it, particularly if he likes the person? None of this will bug you more than a moment. The film’s charm and greatest strength is its self-aware silliness—its refusal to take seriously what isn’t serious. As the six relatives assemble in Cyrus’ creaky mansion, on a dark and stormy night, near the stroke of midnight, we settle quickly into our roles as observers of, rather than participants in, their terror. Several of the family members are cowards. Particularly Aunt Susan (gossipy, easily ruffled), her daughter Cecily (implicit party-girl) and Paul Jones (Harold Lloyd sans urge to make good). They shriek and run a lot. More solid are two of Cyrus’ nephews, Harry and Charlie, who bear some grudge against one another that the movie mentions, then perversely drops. The stage play upon which The Cat and the Canary is based must have expanded on this. Our heroine is Cyrus’ niece, Annabelle (Laura La Plante). Now, I’m not saying lovely Annabelle is the heiress, but it seems awfully likely—and we find out well before the film is done. Annabelle is loved by the good-hearted Paul, resented by Susan, and mostly ignored by the rest. The cast also includes a dour lawyer (and future corpse of a lawyer) named Crosby; an asylum guard in search of an escaped lunatic; and of course, said lunatic, who creeps through the mansion’s shadows and seems to know exactly where every secret panel slides open. All the better to throttle an heiress unawares, I suppose. And we cannot forget, no matter how hard we try, the mansion’s housekeeper, Mammy Pleasant (childless, unfriendly), who probably had a torrid affair with Cyrus, likely in the stage play. I’m rambling. 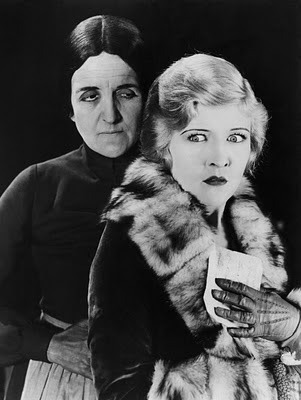 The Cat and the Canary, Wikipedia tells me, is an Expressionist film, perhaps because it has a lot of long shadows, or perhaps because its director, Paul Leni, is an Expressionist director. Leni, more famous today for The Man Who Laughs (1928), had a gift for moving the camera in unsettling ways. Here he confines it mostly to filming from below, meaning the corpse falls onto you instead of in front. But Leni does do one neat thing, repeatedly. The Cat and the Canary is chock-full of what you might call Expressionist (or at least, highly expressive) intertitles. Words like “Ghost!” quiver and shake. Others blur or splatter or fall the length of the frame. This is noteworthy because it’s so rare. Later, over dinner, I asked some friends of mine what other silents they could name that bore animated text like this. They couldn’t come up with many, and neither could I. These effects make you laugh, but they’re supposed to. What intrigued me about them was not how they looked, but the unrealized potential they represented. The Cat and the Canary came out the same year as The Jazz Singer. Two years later, the Silent Era was dead. But imagine if artists like Leni’d had another ten years, or even five, to explore the potential interplay of live action and animated text? Where could that have gone? The result might have looked like a moving comic strip, though not quite like a cartoon—a compound verisimilitude. And I really love things like that. So, sniff. See The Cat and the Canary for that, if you want. Or for some light fare: promised, delivered, and over soon enough. I saw The Cat and the Canary live as part of Revue Cinema’s Silent Sundays series, organized by Pordenone vino-sipper, Eric Veillette. Accompaniment was provided by Laura Silberberg. The Cat and the Canary is also available on DVD, from Kino International. 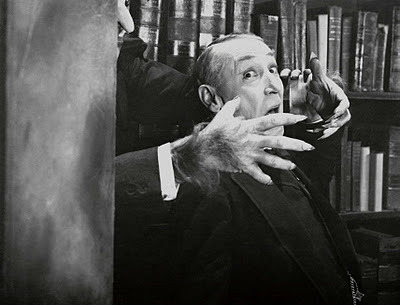 I saw the film for the first time last week, but I'd just seen The Bat a few weeks ago (when I was looking for stills from it, I noticed you'd reviewed it a while back as well), and The Cat and the Canary is pretty much what The Bat wanted to be, I think. Except plus a supervillain, heh. I loved Cat and the Canary - it's pretty slight and yeah, the logic doesn't really work, but like you said, it doesn't really matter. It's a lot of fun to watch. And I also loved the intertitles. Metropolis and Sunrise both do that once in a while (Sunrise more often), but not nearly to the extent that this did. They were awesome. I liked The Bat more, though it's not the better film. Preferred the subject matter. There's also intertitles-as-artwork, which could be the subject of a blog all by itself. The Bat had the crime element to it, I guess, that gives it a somewhat different feel than The Cat and the Canary - that whole opening sequence with the Bat killing the guy through the window and breaking into the bank was pretty awesome and promised a better movie than Cat and the Canary, but the sections in the actual house aren't that different, and I though Cat and the Canary was much more successful there. Agreed. The Bat is the more striking film, visually, but its whole middle portion slogs along. Neither film delves into its characters deeply, but C&C tries harder, and I think, has more talented actors.